Our architecture rides resume on Saturday 2 March 2013 with a ride looking at London’s clocks and bells. Everyone is welcome to join us on this easy going ride around central London. We're all familiar with the phrases 'Bow Bells' and 'Oranges and Lemons, say the Bells of St Clements', and we know about the glockenspiel associated with the Swiss Centre that was in Leicester Square. But when have we ever stopped to listen to the various bells and chimes in London? This ride gives you a chance to do that. 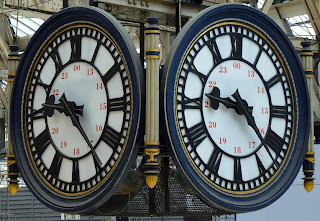 The ride will start with a meeting under the clock in Waterloo Station, SE1 (pictured) on Saturday 2 March 2013 at 11:15am for a 11:30 departure. The ride ends at two minutes past six.